Are you ready for the Goethe-Zertifikat exam? 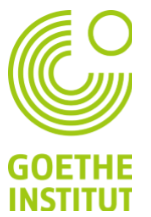 The Goethe-Zertifikat exam is a qualification issued by the Goethe Institut which declares the level of linguistic and communicative competences in German as a foreign language. The exam gives certification for 6 different levels using the Common European Framework of Reference for Languages of the Council of Europe as its guidelines. The exams are designed to assess how learners use German to communicate in real-life situations. So how do you know if you are ready? Here are a few questions you can ask yourself to decide. Are you confident in your current German vocabulary level? Do you understand all of the German grammar rules? Is your spoken German at a high enough level? Do you understand the structure of the Goethe-Zertifikat exam? Are you comfortable using the expert tricks on the Goethe-Zertifikat exam? Can you confidently write an German essay? If you answered 'no' to any of those questions, you may want to speak with one of Live Lingua's Goethe-Zertifikat tutors. The first trial Goethe-Zertifikat class is absolutely free. You can speak with the tutor to see if they think you are ready for the Goethe-Zertifikat test and they can propose a study plan for you. No credit card required, and no commitment. Do you have any questions about the Goethe-Zertifikat exam? You can speak to one of our Goethe-Zertifikat tutors for free to ask any question you may have. They will speak with you and evaluate how prepared you are. Do you have any questions about the Goethe-Zertifikat Level A1 exam? You can speak to one of our Goethe-Zertifikat tutors for free to ask any question you may have. They will speak with you and evaluate how prepared you are. Do you have any questions about the Goethe-Zertifikat Level A2 exam? You can speak to one of our Goethe-Zertifikat tutors for free to ask any question you may have. They will speak with you and evaluate how prepared you are. Do you have any questions about the Goethe-Zertifikat Level B1 exam? You can speak to one of our Goethe-Zertifikat tutors for free to ask any question you may have. They will speak with you and evaluate how prepared you are. Do you have any questions about the Goethe-Zertifikat Level B2 exam? You can speak to one of our Goethe-Zertifikat tutors for free to ask any question you may have. They will speak with you and evaluate how prepared you are. Do you have any questions about the Goethe-Zertifikat Level C1 exam? You can speak to one of our Goethe-Zertifikat tutors for free to ask any question you may have. They will speak with you and evaluate how prepared you are. Do you have any questions about the Goethe-Zertifikat Level C2 exam? You can speak to one of our Goethe-Zertifikat tutors for free to ask any question you may have. They will speak with you and evaluate how prepared you are. Speak To A Goethe-Zertifikat Tutor Today! What makes Live Lingua Goethe-Zertifikat tutoring different from the local tutors or enrolling at a local language school? Native German speaking teachers with years of experience. And best of all, we let you meet and speak to your future Goethe-Zertifikat teacher before having to commit to paid classes! The more Goethe-Zertifikat lessons you enroll in at the same time, the cheaper the hour of class gets. Still not sure if Live Lingua Goethe-Zertifikat tutoring is the right choice for you? Then just try a free lesson with one of our tutors to make sure. No risk, no commitment. Take a 60 minute trial Skype German lesson with one of our Skype German teachers. No credit card required. Our German teachers have university degrees and years of German teaching experience. This was the 3rd Skype German service I had tried. The first two were online directories with German tutors, but the quality of the teachers was very low, and there was no actual staff to help me if I had problems with the teachers. Live Lingua [German] school is a much better option. I have had 2 tutors with them and both have been excellent, and I like knowing that there is a real person I can talk to take care of any problems I have with my classes. If you are like me and looking for a better option, Live Lingua is the right choice.